Sea Turtle Nesting Season Rules – To comply with regulations that protect the turtles, beach driving and lighting rules are in effect May 1 to October 31. Vehicular traffic on the beach is only allowed from 8:00 a.m. to 7:30 p.m. and all beachfront properties are required to reduce the impact of interior and exterior lighting which may impact nesting sea turtles. Sea Turtle Nesting Season, Volunteer Opportunities and Share the Beach. Check out our Share the Beach brochure (26MB), St. Johns County's guide to sharing and protecting the beaches. The beaches of northeast Florida are considered as an important nesting area for the loggerhead (Caretta caretta), green (Chelonia mydas) and leatherback (Dermochelys coriacea) sea turtles. Sea turtles emerge from the Atlantic Ocean to nest on our beaches each summer (May 1 to October 31). Females crawl from the water late at night to lay their eggs. They deposit, on average, 100 ping pong ball sized eggs in each nest. They usually lay 2 to 3 nests per season on a 2-3 year cycle. The eggs incubate in the sand for about 2 months. As the conditions have cooled inside the egg chamber the hatchlings emerge out of the nest as a group. As the young turtles exit the nest they instinctually seek the horizon by looking for natural light reflecting off the water. Upon reaching the water, hatchlings begin their journey spending their first days of their lives swimming offshore. Once there, the tiny sea turtles crawl into mats of drifting algae called sargassum. They spend the first few years of their lives passively drifting on their oceanic rafts feeding on almost anything they can catch in the sargassum. After a few years, the juvenile sea turtles leave their protective nursery and move to inshore feeding grounds where they spend the rest of their pre-adult lives. Ultimately, at the age of 12 - 30, adult, female, sea turtles return to their natal beach to lay nests of their own. Estimates predict that about one in a thousand hatchlings survive to adulthood. Every morning between May 1 and October 31 sea turtle volunteers patrol the beaches looking for signs of sea turtle nesting. 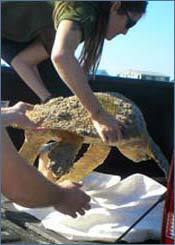 Each sea turtle emergence is examined and documented as a nest or false crawl (a non-nesting emergence). Each nest is marked with stakes, flagging, and, if necessary, covered with a metal screen to protect it from predators. After a nest has been marked, it is carefully monitored for signs of tidal inundation, predation, and finally hatching. After the hatchlings emerge from the nest volunteers return to evaluate and document how many hatchlings emerged. The eggs are counted and a hatching success (the number of hatched egg shells in relation to the total number of eggs) is calculated for each nest. What is the exact location of the animal (i.e. name of beach or access point)? Is the turtle alive or dead? What is the approximate size of the animal? Is the turtle marked with spray paint? The answers will give us the information we need to respond quickly with the correct equipment to handle the animal. An animal with spray paint indicates the turtle has already been documented. If you find a sea turtle floating in the water get a GPS reading, take pictures, and call the Florida Fish and Wildlife Conservation Commission at 1-888-404-FWCC (1-888-404-3922).